This is a simple casserole that everyone in my family LOVES! 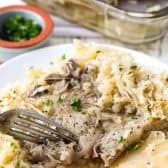 Layers of tender potatoes, tender pork chops and zesty apple sauerkraut! Place potatoes and butter in a 9×13 pan. Toss with garlic powder and salt & black pepper to taste. Season pork chops with salt and pepper. Brown over medium high heat, about 3 minutes each side. Meanwhile, combine sauerkraut, brown sugar, onion, granny smith apple and caraway seeds in a bowl. Place 1/2 of the sauerkraut mixture over the potatoes. Top with browned pork chops and finally remaining sauerkraut mixture. Cover tightly with foil. Reduce oven to 325 degrees and bake for 2 hours. Uncover and bake an additional 15-30 minutes or until fork tender. Serve warm with applesauce. You’ll want to choose a marbled pork chop that has some fat in it such as a sirloin chop or shoulder chop. If your chops are really large, they can be cut in half. Cooking leaner cuts for extended periods of time can result in a tough chop. Nutritional information is based on the use of 6 x 6oz pork shoulder chops and will vary based on type of pork selected.